There was a time when a comment like, “I have a two hour layover, I guess I’ll wait in the airport lounge” would have been met with pity or questions as to whether that’s a good idea. The collective airport, for several years, had become as welcoming as the sight of a fiance crashing the bachelor party. Not so much these days, though. After the frustrations and aggravations that were borne amidst busy travelers and unrelenting security checks of recent years, it looks as though airports have become an ideal waiting area for those extended layovers. Whether it was an overwhelming amount of bad publicity or a genuine effort to make these areas comfortable again, these days, it’s all about a more mellow state of mind, complete with technology and a host of other services you might be surprised to discover. Even better, the right credit card can up the luxurious status even more. This week, we take a look at how far airports have come in cleaning up their image (and let’s face it – when the airline drops the ball, the airports take the hits too) as well as making them traveler-friendly. 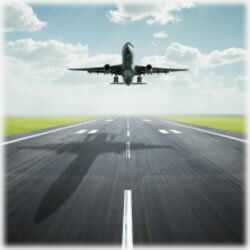 We’ll also toss a few great credit card offers out there that have the best rewards travel programs. In its annual report, ACI-NA Passenger Services Survey discovered 88% of all airports in the U.S. have ample electrical charging stations for passengers. Not only that, but 90% of the airports surveyed also are now offering travelers complimentary wi-fi. It’s all about staying connected and in a convenient way. You might be surprised to learn the study also revealed more than 85% of these airports now offer local art displays and believe it or not, live music is offered in 34 airports. Half even offer playrooms for the little ones. If you’re like many of us, the thought of flying is a bit intimidating. Whether it’s two states or two continents, many have a genuine and overwhelming fear. Imagine being able to find a relaxing massage or spa where you can have your hair and makeup touched up and a new set of acrylic nails, too. This highly ranked travel rewards card offers up a lot of amenities for travelers. Card holders can earn up to 25,000 bonus points quickly while also earning 3 points for every dollar spent on Virgin America purchases and one point per every dollar spent anywhere else. There’s a low introductory rate on balance transfers, too. The complimentary $150 savings on a companion ticket each year makes it easy to plan a getaway without blowing the budget. There are no blackout dates on seats or flights, either. There’s a $49 annual fee. It’s issued by MasterCard, so your purchases are protected and when you apply now, you can get an instant decision. Good credit gets you an approval. Did you know the San Francisco International Airport has adopted the idea of playing music at the security checkpoints in its international terminal? Did you know it also provides three free bicycle assembly stations? Another change includes a complimentary water hydration stations that allow a passenger to empty a water bottle before security, take it through and refill it for free on the other side of security. Not bad, right? Meanwhile, Denver International Airport took a step into the past when it installed more than two hundred traditional land line phones in its terminal and offers travelers free phone calls, provided they’re domestic calls. For those making international calls, the first ten minutes are free. Wondering how they do this for free? It’s because the service is ad-supported, which means callers must listen to or watch a short ad before being connected. Another great card that allows you to rack up rewards is the Gold Delta SkyMiles Business card, offered by the American Express OPEN network. Card members earn a bonus 30,000 travel rewards points when they spend $500 during the first ninety days of opening the account. Plus, you can check your first bag for free – and in fact, up to 8 people in your reservation will also enjoy this perk. You’ll enjoy double miles on Delta purchases and 1 mile for all other eligible purchases. There’s a 20% in flight savings and priority boarding, along with a $0 intro annual fee (after your first year, it’s $95 annually), that round out this credit card offer from American Express. An excellent credit rating gets you approved. It’s been said McCarran International Airport in Las Vegas is one of the more liberal airports in the country. It offers smoking lounges, gambling opportunities and now is the first to offer a liquor store right in the baggage claim section. Purchase cigars, snacks, wine, liquor and even tumblers and champagne flutes. Even better is the tasting events this area hosts. It’s almost like a retreat away from the humdrum of daily life. We all know the limitations of available food at airports – it’s often a choice between fast food and starving. These days, though, it seems airports are turning their attention to the healthier aspects of good living and many now offer healthier food choices like fruits and vegetables and even honey is being sold at airports – or should we say, it’s being sold out. Travelers are really taking to these options. Ah…it’s all about loyalty, right? We love our rewards programs offered by our credit card programs, but there are some airports that are getting in on giving thanks. The Thanks Again loyalty program is found in 170 airports around the country and your points and miles can be used for travel, food and even parking. It’s a great way for airports to further polish their images while keeping flyers happy. Other perks and benefits easily found in airports these days including retailers for easy shopping and TSA pre check programs. TSA has consistently been a contentious subject but now it looks as though it too is trying to clean up its image – and not a moment too soon. It looks as though airports have again become the less stressful and even interesting crossroads of people going places and doing things. With fewer stresses and more in the way of perks and opportunities, we say it’s a welcome diversion as we travel the world.